Picture of Jerald Finney, age 71, taken in January 2018. 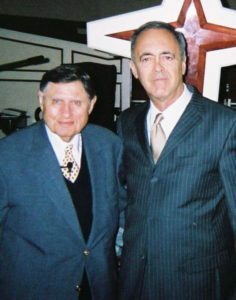 Dr. Greg Dixon and Jerald Finney at Capital City Baptist Church, Austin TX, 2008. I will be devoting all my working time (many hours every week) to the BLC; to helping churches who wish to please God by remaining under the Lord Jesus Christ alone. Man’s highest law, the First Amendment and corresponding state constitutional provisions are statements of Bible principles which protect the right of churches to choose to remain under God only. Such churches enjoy many advantages over churches who choose to place themselves under man’s law rather than remain exclusively under God’s law. My hope is that churches will join me in this work. As the Lord provides, I envision not only continuing my present efforts which are many, but also working with churches and pastors in organizing conferences in different parts of the country. Please share with me any ideas you have for furthering this work. All contributions will be used for BLC related matters and complete records will be kept of all contributions and disbursements. Those records will be available for any contributing BLC church or individual. May the Lord richly bless you and yours. Grew up in conservative west Texas. Graduated high school in 1965. Graduated with a BBA in economics from Texas Tech in 1970. Army officer 1970-1972; served in Viet Nam. Worked for Railroad and operated a photography studio, 1972-1990. Saved in 1980. Member of 3 different fundamental Baptist churches since saved. At the Lord’s calling, entered the University of Texas School of Law in 1990. Graduated in 1993. Started practicing law in January, 1994, following the Lord one step at a time. Have practiced law since. Now devoting all my time to the BLC and related matters. At the invitation of Dr. Greg Dixon, became the lead counsel for the BLC in 2005. Resigned from that position in 2011. Became in-house counsel for BLC in 2017. Became National Director and Lead Counsel for the BLC, February 1, 2017. Led street preaching ministry 6 or 8 years and participated weekly starting in January 1994 til recently. Took over a rest home ministry when the leader moved. Continued until the rest home closed down. Started a ministry at an assisted living center; turned it over to a dear family who has faithfully helped with and loved the ministry and the old folks. Started another assisted living ministry, which, after a few years I turned over to another family who loved the ministry. Those ministries were still active the last I heard a year or two ago. Door to door evangelism once or twice a week while I was in Austin TX. Faithful church attendance. Very active in the Republican Party for 20+ years after I got saved. At first, attending precinct convention, introducing resolutions (100 at the first meeting I attended). I became precinct chairman, served on committees, election judge, went to precinct, county, district and state conventions. Went to one national convention. Dr. Greg Dixon, for 41 years was pastor of the 8,000 member Indianapolis Baptist Temple. He has made headlines once again with a new hard hitting book entitled, The Trail of Blood Revisited. Dr. Dixon was carried out of his church by federal marshals on Feb. 13, 2001 after a 93 day siege, in a peaceful protest against a court order, because the church did not pay alleged federal withholding and FICA taxes which the church claims violated their faith. A graduate of Baptist Bible College, Springfield, MO in 1953, Dr. Dixon served as 2nd V.P. of the Baptist Bible Fellowship International and was the National Secretary of the Moral Majority founded by Dr. Jerry Falwell. He was also one of the first preachers in the nation to conduct a T.V. program and later expanded it to all fifty states and world wide cable networks. Dr. Dixon is the Editor of The Trumpet Newsletter, the voice of The Unregistered Baptist Fellowship, which he founded along with other like minded pastors. He has served as the National Director of the Biblical Law Center, which aides churches in claiming their 1st Amendment rights, since 2004. He has been a guest on numerous nation wide TV and radio shows including the Today Show, The Jerry Springer Show and The Sally Jessie Rafael Show. He has been a guest columnist for U.S.A Today on several occasions. He is now a regular columnist for Freedom’s Phoenix an online conservative daily publication. 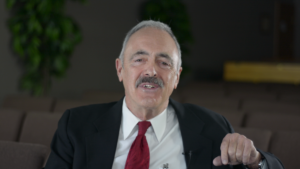 In 1983 Dr. Dixon led his congregation to reject their not-for-profit corporate status and tax deductible gifts and as Dr. Dixon stated, “began operating under God rather than government.” A terrible price was paid by the congregation for that decision when the church facilities and 22 acres of land were sold, after a 93 day siege and raid by 100 federal marshals on February 13, 2001, to the Christel House Foundation of Indianapolis. They bulldozed the church facilities and established a Charter School in the same school buildings that saw as many as 700 enrolled in the Temple’s 31 year old church school. The Trail of Blood Revisited is a continuation of J.M. Carroll’s 125 year old booklet The Trail of Bloodthat has seen more than 2 ½ million sold. Dr Dixon has described his book, “As a warning to the pastors and churches of America”, after spending 25 years studying how the government plans through the IRS to control every church in America including the content of the sermons that are preached. Dr. Dixon has received five honorary doctorates including his alma mater and Bob Jones University of Greenville, S.C. He resigned from the active pastorate of the Baptist Temple in 1996 when his son Rev. Greg A. Dixon continued on as Senior Pastor after serving for many years as CO-Pastor. Dr. Dixon, who is Pastor Emeritus, reenergized, spends his time traveling in the work of the Law Center and writing. He and his wife Wanda divide their time between Indianapolis and Rockledge, Florida. They also have two daughters, both married, and nine grandchildren.